The self-mutilation of hundreds of prisoners in a colony in southern Russia has highlighted a mass of allegations of abuse and mistreatment throughout the country's prison system. Latest unofficial reports say that up to 700 inmates have been taking part in the protest in the prison in the town of Lgov, cutting their veins or necks, though the official figure is 260. Officials say the inmates were being organised by criminal gangs inside the prison which were trying to destabilise the situation, and that there had previously been no complaints there. But human rights groups say the incident is the culmination of the despair to which many have been driven. Cases of abuse in the prison are part of a new authoritarian trend in a system that was never properly reformed after the Soviet era, Lev Ponomaryov of the For Human Rights (FHR) movement told the BBC News website. There have been some tentative improvements in the penal system in recent years, particularly towards reducing overcrowding in custody cells for people awaiting trial. But the way prisons is run is a key issue. Mr Ponomaryov said that in 2004 FHR recorded a sharp rise in the number of "cleansing operations" - raids on prisons by special forces aimed at restoring order. These involved beatings and often maiming of inmates with truncheons, he said, adding that at least 10 colonies were involved. These raids sometimes took place after changes at the top of the prison administration, Mr Ponomaryov added. Last year several new governors were appointed, and immediately set about stamping their authority. And while there has been no "order from above" to crack down on prisoners, FHR says there is a definite tendency at a regional level towards harsher treatment. "In Russia undoubtedly a police regime is being strengthened," Mr Ponomaryov said. 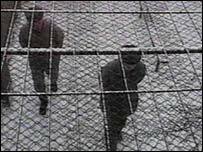 Prison protests were reported in Siberia and the Urals in April 2004, with inmates going on hunger strike in protest at alleged abuse by the authorities. Also, inmates have written to FHR saying they were being made to march and sing for hours to the sound of a "fife and drum". In a report last year called the "Russian Abu Ghraib", it described inmates being strip-searched in groups of between 10 and 20. Eyewitness accounts suggest abuses at Lgov were particularly bad. One former inmate, who was released in May, told the BBC News website that he was so incensed by the regime there that he felt compelled to slash his veins just weeks before he got out. Alexander Malikov said he had been threatened with serving in a punitive detachment on a trumped-up charge for the remainder of his five-year term. He said members of the detachment were constantly exposed to beatings by so-called "activists", inmates hired by the authorities. "I only had 36 days left till I was getting out," he said. "I didn't want to have to put up with all that." Malikov said there had been other similar individual cases at Lgov prior to the latest incident, but now there was a general feeling of hopelessness. "Now people are tired of putting up with this," he said. "Mothers are crying, no-one can do anything." Mr Ponomaryov said that the latest protest was so large because it appeared some authoritative figure had appeared among the inmates to organise them, adding that he believed this was a good thing. "In prison people still have a right to collective action when they're in despair, it's right that this should happen," he said. The Russian authorities say this is a case of organised criminal activity. "The activities of the inmates seems carefully planned, as demonstrated by the fact that they started simultaneously in 10 blocks of the colony," said a statement by Kursk region prosecutor's office, which has jurisdiction over the colony. The inmates were trying to destabilise the situation in the prison, and there have been no complaints previously about the conditions there, it added. However, the Russian prosecutor-general's office has confirmed four cases of beating at the colony and said charges would be brought against prison officials.